With all the talk about cholesterol, both healthy and high, good and bad, you may wonder exactly what it is. Given the answer—waxy, fat-like molecules made in the liver—it sounds undesirable in any amount. But the body needs cholesterol to make hormones, convert sunlight into Vitamin D, and produce bile acids to digest fat. It’s also a good predictor of heart attacks and strokes. “The amount you carry depends on your genes, plus your dietary and exercise choices,” said Clint Allred, MD, cardiologist with University of Utah Health. Consider Melissa, a woman age 42, height 5’6”, weight 160, BMI a little high at 25. A busy accountant, she grabs takeout for lunch, but cooks dinner at home for her family and rarely drinks alcohol. Twice a week, she walks with friends and does Pilates. She smoked half a pack of cigarettes a day until her first pregnancy. And two years ago, her mom suffered a heart attack at 60 but survived. At 240, her total cholesterol is high, but how it’s made up is also crucial information. The good: The HDL means Melissa has ample amounts of “good” cholesterol to carry LDL away from the arteries and back to the liver, where it’s chewed up and removed. 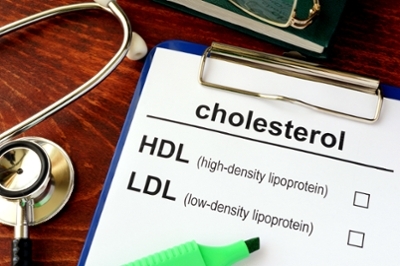 The bad: Borderline-high LDL means “bad” cholesterol may build up on the artery walls as plaque—and inflammation and injury to the walls could result in a heart attack or stroke. In addition, she has high triglycerides. Given Melissa’s age and lack of other medical problems, like high blood pressure or poorly controlled diabetes, her doctor starts with lifestyle changes to control cholesterol. He suggests a Mediterranean diet of fruits and vegetables, nuts and legumes, and fish instead of fatty red meats to help her lose 10 to 20 pounds and reach a BMI under 25. He also encourages her to rev up her heart rate with more demanding activities like hikes and Zumba for 30 minutes, five days a week. And she must avoid taking up bad habits like smoking or heavy drinking. If Melissa returns next year at 165 pounds with a total cholesterol of 245 and LDL of 160, her doctor will likely prescribe medication to lower her LDL and triglycerides. She’ll still need a heart-healthy diet and regular exercise. But given the scare from her mother’s early heart attack, Melissa is motivated to lower her cholesterol and, with it, her risk of having a heart attack or stroke herself. Diana Kightlinger is a writer, journalist, essayist and author with a special interest in health and wellness. She has written for many publications, including the Washington Post and Chicago Tribune, and is co-author of “BlabberMouth: 77 Secrets Your Mouth Can Tell You To Live a Healthier, Happier, Sexier Life.” She holds master’s degrees in environmental science and journalism.